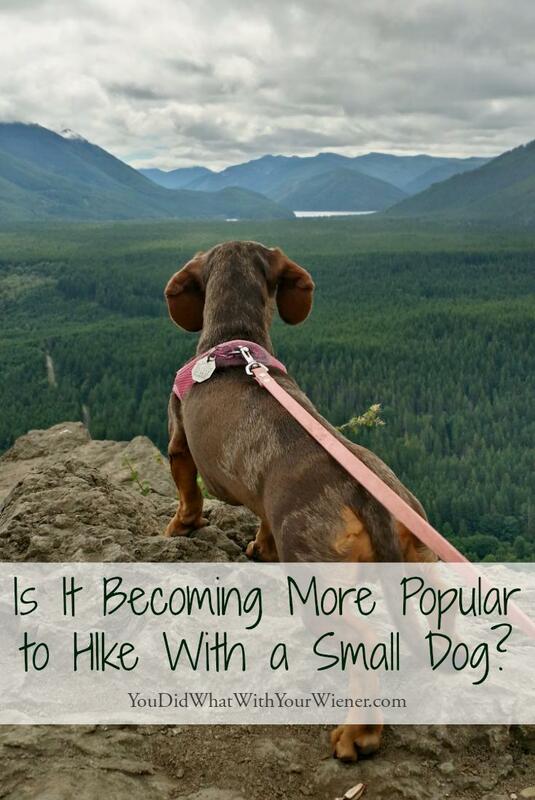 Is It Becoming More Popular to Hike With A Small Dog? You are here: Home / Life With Dogs / Is Hiking With a Small Dog Becoming More Popular? Is Hiking With a Small Dog Becoming More Popular? I live in Seattle, a city that now officially has more dogs than children. When I first started hiking with Chester over 10 years ago, encountering other small dogs (typically classified as being under 25 lbs) on the trail was VERY rare. I know that part of the reason Chester got so much attention when we were out hiking was because he’s a “funny looking” Dachshund. However, for most people, it’s because they were blown away that a small dog could keep up with me. Over the years, I’ve seen the trend of hiking with dogs in general explode. I mean, it was probably never NOT a popular activity but hiking in general has gone mainstream. More people on the trail means more dogs. That also means there is an increased chance of seeing small dogs hiking alongside their owners. I have been seeing more for sure. Before I started this blog, I remember telling my friends about my adventures with Chester. Both on trail and off, I was met with skepticism that Chester was a small dog capable of hiking long distances without any help from me. They would always say things like “You took Chester WHERE?”, “You didn’t have to carry him at all? ?”, and many other “shocked” questions and comments about hiking with a small dog. (This was the inspiration for the blog name). Through my experiences, I started to learn that people didn’t think small dogs were capable of being great adventure companions or that they could be active for long periods. I was disappointed because I know that inactivity leads to excess weight and poor health. Also, small dogs are still dogs. They need the mental stimulation of chasing smells and experiencing new things just like any other. I was frustrated that people didn’t understand their little dog NEEDED to be active. To be honest though, Chester was my first dog as an adult. I wanted a big dog who could hike with me. I ended up with a Dachshund. Not “knowing any better” about small dogs, I made the best of what I had. I took him hiking and camping with me often and he loved it. 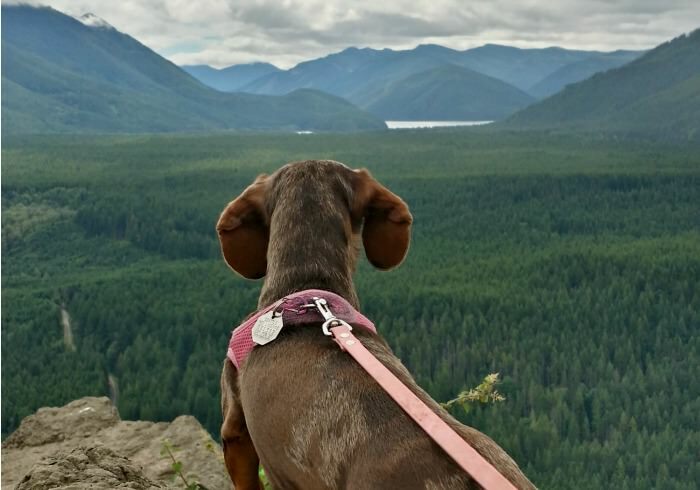 I didn’t know any other small dog, or Dachshund, owners so, based on people’s shocked reactions, I started to wonder if his ability and drive to climb mountains was just a fluke. I was worried that she wouldn’t like hiking but I wasn’t going to mess around trying to figure that out. The day after I adopted her, my hubby and I took her on a 4-mile hike. Uphill. In the snow. (not kidding) And she loved it! That day, I became convinced that my purpose was to get the message out – small dogs need and deserve plenty of exercise too and make great adventure buddies. I decided to start this blog to help other people learn what their small dogs were capable of. I’m happy that, today, I see more small dogs hiking on the trails than I used to. On some hikes, we even see more small dogs than big ones. I like to think that I had something to do with it (in reality, that’s probably not the case but…). I’m not positive why the trend is increasing. Like I said, I’m sure it has a lot to do with more people hiking, and more people hiking with their dogs, in general. I think it also has to do with the trend of small dog ownership growing. When I was a kid, I didn’t know anyone that thought much of small dogs. They talked about them like they weren’t “real dogs”. Thankfully, those attitudes are changing. UPDATE: Since publishing this article, I’ve had people from other areas of the country say they still see more big dogs out on the trail than small. Now I’m wondering 1) Even though those people are still seeing proportionally more big dogs than small, do they still see more small dogs hiking than they did years ago? and 2) How much geographic area and urbanization (the Seattle area is very urban) affects an owner’s “dog size” preference. Dog ownership in general is on the rise but the percentage of small dogs to bigger dogs is also growing. Packaged Facts’ Pet Owner Survey indicates that a higher percentage of U.S. households have small dogs (under 25 lbs.) than medium dogs (25-40 lbs.) or large dogs (40+ lbs. ), with the figures being 52%, 32%, and 42%, respectively. Aging baby boomers may prefer small dogs because they are easier to travel with once they retire and many assisted living facilities now allow people to move in with their small dogs. Smaller dogs also fit well in apartments and urban settings so they are desirable to both Millennials who don’t own a house yet and baby boomers who have chosen to downsize. Small dogs are also cheaper to feed. Like me, people are ending up with small dogs – whether it be due to lifestyle choice or circumstance – but they don’t want to miss out on the “regular” things that owners of bigger dogs do with their pups. They are choosing small dog breeds that can hike, run, or participate in sports like agility so that they can be active with them. Also, in general, people are treating pets like family these days and that means sharing all family outings with them. They’re willing to do whatever it takes to do that and if it means that they DO have to carry their small dog when they get tired, they are ok with that (instead of leaving them home because they felt inconvenienced or embarrassed). Hiking with small dog is different than hiking with a big dog in many ways but they’re just that – different. It’s not necessarily a negative thing. In fact, there are many advantages to hiking with a small dog. I’m hoping that the trend of hiking with small dogs will continue to grow. And I want to help make it happen. My main challenge right now is figuring out what is holding people back from hiking with their small dogs. I know in most situations, the owner is just not a hiker and doesn’t have any interest in getting into it. But I don’t think that’s the only challenge. What about those people that are curious about hiking but not yet ready to try it? 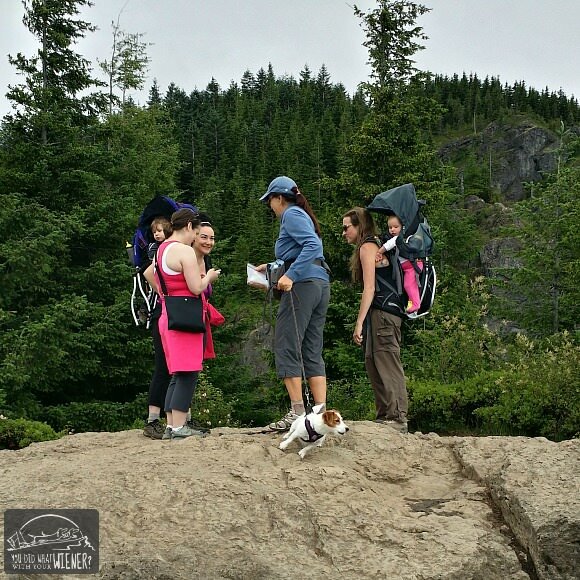 Or those that do hike but, for whatever reason, don’t take their small dog with them? Do own a small dog? If you do, are you active with them? If you’re not, what’s holding you back? I would love to help so leave a comment below! We don’t have many small hiking dogs in my “hiking in utah with dogs” group. I posted your article in the group to see what kind of response there is on this. Great article! That’s interesting. I run a Meetup group for active dogs and 80% of the dogs that show up and medium or small. At many events, only small dogs show up. It may have to do with where I live? Being in Seattle where many people live in little apartments or condos might be affecting it. Regardless, even for the Seattle area, I still see more small dogs on the trails than I used to. Curious if anyone has responded yet? I’m very interested to learn what people are seeing/experiencing in other areas of the country. Hi Jessica! I first discovered this website about a year or so ago when I googled ‘hiking with a chihuahua’ – it led me to your blog post about the advantages of small dogs. In the past I’ve only had smaller breed dogs like Jack Russells or Whippets and they always came with me on my birdwatching jaunts which would usually be from dawn until mid-afternoon. I’ve always wanted a Chihuahua however after meeting THE friendliest little girl at my local riding school in the 1980’s and this longing never wavered. The only thing which stopped me was working full-time and not having the time to properly devote myself to a dog. I’ve just turned 49 and changed jobs to one with a lot less hours and have promised myself a pup or rescued adult next year for my 50th (I’m saving my pennies as we speak!) and cannot wait to take her everywhere with us on days out and walking holidays…..and do just as you have done and show people that small dogs DO have four legs that actually work and are as capable as any bigger breed of enjoying days out with their owners. We may not have the same amount of amazing mountains here in the UK but, especially in my home county of Northumberland, we do still have mile upon mile of open countryside, woodland and hills where you can walk for miles and barely meet a soul. Even our stretch of glorious coastline (60+ miles) is dog-friendly all year round yet can be empty of others for the majority of the year. Absolute heaven! Gillian – Hi, I live in Cornwall with my French Bulldog and English Bulldog – I would love to start exploring with them ( I moved here a couple of years ago ) Maybe we could do a joint blog about hiking with our little dogs in the UK ? Just a thought – my site is http://www.yogadogs.co.uk – are you a blogger ? We occasionally see small dogs on trails. Mostly the flat/urban ones though. Mr. N is usually the smallest dog on the trail wherever we go! While my Huskies and I don’t go hiking out on trails, it is interesting to hear this. I’m curious, too, if it is all over or regionally. I do know of some previously large-breed dog parents who now have smaller breeds due to easier transportability and being able to pick their dog up more easily when they want/need to. Maybe that’s part of the reason there are more on trails, too? That and, yes, I do think you had something to do with it! 😉 Interesting post! In Australia it’s rare to see dogs hiking, as they are prohibited in all national parks, leaving not many options. We’ve loved taking Schnitzel hiking since we’ve been in Europe, but haven’t seen many other dogs out on the trails. I heard that about Australia. In the US, it’s rare that dogs are allowed in National Parks (well, they can stay in your car but that kind of defeats the purpose). We have many other types of parks though, and forest service land, where dogs are allowed. That’s interesting about Europe. My hubby and I went a few years ago to hike the Tour du Mont Blanc. We didn’t try and bring the dogs for many reasons. That trail can be a long thru-hike but, in many sections, it was shorter trails linked together. We didn’t see many dogs either. I thought maybe it was because the trails was long and hard but perhaps people in Europe just don’t hike with their dogs as much as we do in the US? I wish I could take my mini(-ish?) dachshund out further. (She was just on the road in the rain one night and I never found the original owner.) It would definitely help ME be more active. She absolutely HATES cars though. She’s gotten better about immediately peeing, and maybe if I brought a friend… I can’t drive with an excited dog in my lap and she is NOT happy with the car movement or the seat belt! Even though I’ve made sure that the dog park is on the other end of that ride more than the vet. She likes getting IN cars – when the neighbors come home she makes a beeline for the driver’s lap. I’ve gotten moderately better results if I open the window – as long as we’re still moving – probably because all the smells are fun. Hi Jamie. Bummer that your pup doesn’t like car rides. Have you read my article about that? It’s called “When You Want to Go Hiking but Your Dog Hates the Car.” http://youdidwhatwithyourweiner.com/when-you-want-to-go-hiking-but-you-dog-hates-the-car . It sounds like she might be getting car sick or, at the very least, has anxiety that’s only present when the car is moving. I hope you’re able to get in a few hikes close to home in the meantime before you find a fix for her. Thanks! That definitely helped narrow it down (she’s anxious, not carsick). Rolling down the window a bit so she can smell all the things outside seems to help, and hoping that a few regular trips to the nearby dog park will break her bad associations. Odd part? she’s fussier when the car is STOPPED! I wonder if something that boosts her up a bit would help – I think she might be a bit bored and climbing into Daddy’s lap to see out the window as much as because… well, lap. I’m glad you’r eon your way to finding a solution. It IS odd that she’s fussier when the car is stopped. The only thing I can think of is that she thinks she’s getting out when the car is stopped so she goes a little nuts with excitement 🙂 Somehow, Gretel can tell when we are getting close to a trailhead and she starts squealing with excitement! Loved your article. I wanted to share that I’ve been hiking now with my dog Roxie since she was a puppy. She’s 12 now, so, like me, she is slowing down but oh the places we have hiked with her would astonish most people. In her younger years she often did anywhere from 5-12 miles in remote areas of Idaho, Montana, and Washington. 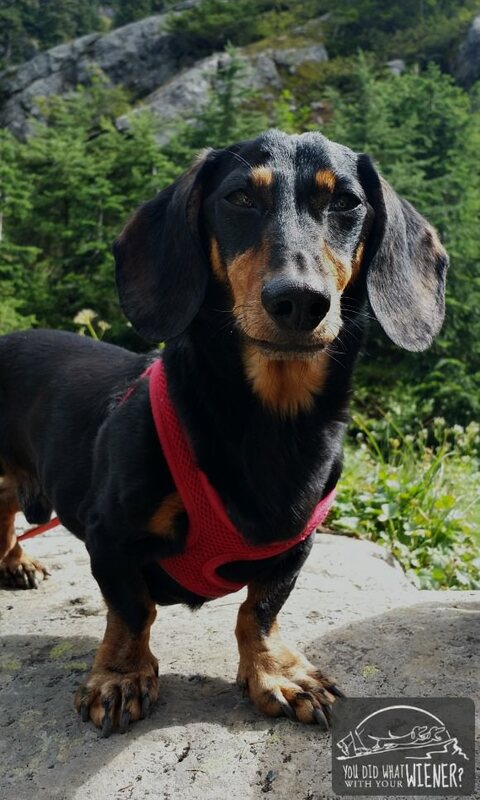 Most people we encountered could not believe that this little doxie -about 15 pounds- could hike such distances in such rugged terrain. Sometimes we would have to bushwhack and she was able to navigate the downed logs and brush on her own with minimal problems. When stream crossings were too dangerous I was able to launch her (carefully) to my husband across the creek. One of her hikes was up to the lookout in the Mallard-Larkins wilderness area. I think it was about 12 miles and she did fantastic! She seemed to like it best when my husband was in front, she in the middle, and I got to bring up the rear. We’ve had her camping and jeeping a lot, four-wheeling in the Gravelly mountains in Montana and even on a few hunting trips. She’s a trooper and we’ve had so much fun with her on our trips. I’m sad that she’s getting older and with her vision and hearing problems I may have to figure out a backpack system where I can carry her so she can still enjoy the outdoor adventures!